Frenchie Swag – Now Available! 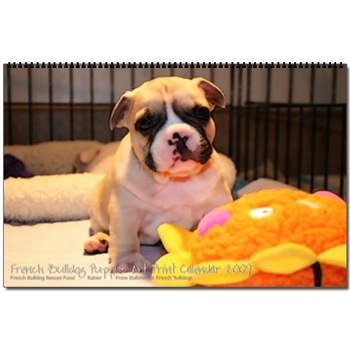 I’ve taken some of my personal favorite French Bulldog puppy photos from the past year, and put them on a selection of mugs, calendars and greeting cards. 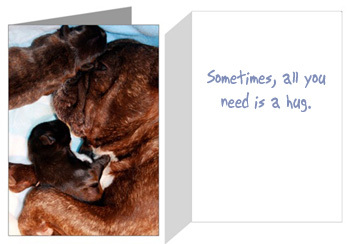 100% of all proceeds benefit French Bulldog rescue, via the Karen Krings Memorial Fund and the French Bulldog Village. https://i0.wp.com/www.bullmarketfrogs.com/wp-content/uploads/2015/04/Brindle_pied_frenchbulldog.jpg?fit=662%2C662 662 662 frogdogz http://www.bullmarketfrogs.com/wp-content/uploads/2015/06/bullmarket-logo.png frogdogz2008-11-27 20:31:202008-11-27 20:31:20Frenchie Swag - Now Available! Another reminder that Elliott and I will be in Mississauga this weekend, at the International Center near the airport, where we’ll be attending that Caledon Kennel Club show. This is a good chance for you to drop by and chat about Frenchies. If you’d like to do so, email me and I’ll give you our entry times. Dexter will be showing at Lansing, Michigan this weekend with Barb. Again – a good chance to drop by and talk dogs, if you’re in the area. If you’ve never been to a dog show before, I highly recommend attending one. For some people, this will be their first chance to see some of the more rare breeds in the flesh – and often times it’s the first time you’ll see dogs that really look the way the standard spells out. 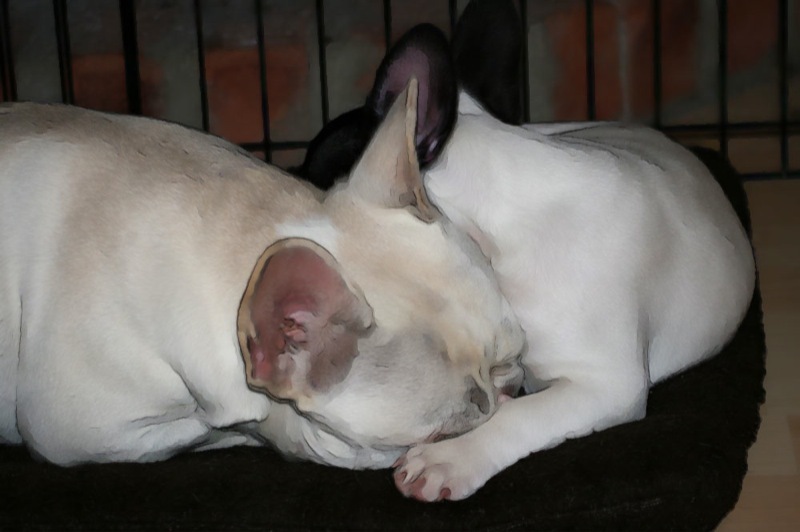 There’s a great difference between a show ring Frenchie, and that Russian import you’ve seen careening around the park. You might surprised at how much difference there is between dogs, even within the breed ring. 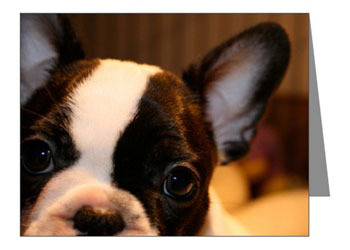 You’ll see super short French Bulldogs, medium length Frenchies and Frenchies that could compete in the Dachshund ring. You’ll see tiny little triangular ears, and great big flapping sail sized ears. You’ll see long noses, medium noses and noses that are punched back into the face (hint: the first and second ones are better). All of this variety can give you a better ‘eye’ for what type of Frenchie you are hoping to find for yourself. 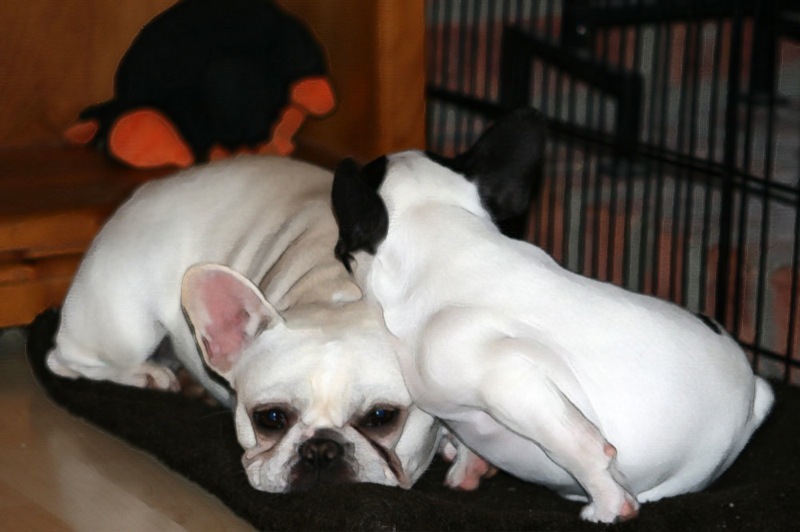 Approaching breeders at shows can be a much trickier matter. First off, you need to remember that while you’re there to socialize, breeders and their dogs are there to compete, an issue taken with deadly seriousness by some people. Approaching breeders as they stand ringside or are running around prepping for their class isn’t recommended. They’re too busy, too nervous, and just generally not in a state of mind to answer questions from people they don’t know. You also need to bear in mind that the person taking the dog into the ring isn’t necessarily – or even probably – the breeder. Many breeders use professional handlers, especially breeders like myself, who tend to trip over their own dogs. A good piece of advice from breeder Sergio Blois, of Avlis and Bloa French Bulldogs in Argentia, is to grab a copy of the time table when you first arrive at the show. It will list ring times for each of the breeds. Look it up, and you can arrange to be ringside to watch the showing. Give the breeders an hour or so after their ring time is over, and then go find them – they’ll probably be in the grooming area. People tend to be much more relaxed once they’re done in the ring – either that, or they’re outside, kicking the building and cursing the judge’s bad taste. Hint: don’t approach breeders while they’re kicking buildings. Another good piece of advice: At summertime shows, cruising the RV parking area is a good chance to talk to breeders while they’re relaxing. Bear in mind that most breeders aren’t adverse to a beer or two, so visiting at night when they’re a bit too relaxed isn’t necessarily a great idea (although it can be entertaining). Once you locate the breeders, check to see if that’s who they actually are – they might be the breeder’s ‘agent’, or handler. In that case, while they can provide some basic information and contact information for the breeder, don’t expect them to know everything. Ask the handler for a business card for the breeder (most will have some on hand), and contact them directly. Even experienced, polite dog people who follow every recommended protocol about approaching breeders still sometimes run into jerks. The dog breeding world is sadly littered with people who suffer from ‘big fish, small pond’ syndrome – the attitude that anyone attempting to speak to them should only do so while bowing and scraping. Simply put, there’s only one way to deal with this sort of nonsense, and that’s to walk away and take your purchasing dollars elsewhere. Chances are good that this sort of ringside Princess wouldn’t have been interested in selling a dog to you anyways, unless you were looking for an overpriced show potential puppy with a ten mile long contract (signed in blood, usually). Don’t take it personally – jerks like this are rude to everyone. There are lots of other, much nicer fish in the sea who’ll view you as a chance to natter on for hours about how wonderful all of their dogs are. In fact, the biggest issue with this other kind of breeder is being able to politely get away from them before they pull out twenty years worth of photo albums of every puppy they’ve ever bred, co bred, or admired from a distance. Not speaking from personal experience, of course. If you’re intimidated by approaching breeders at the show, you can always simply view this as a form of catalog shopping. Literally, that means picking up a copy of the show catalog, and taking it with you to ringside. The show catalog has a list of every dog entered each day. Next to each dog is their ‘number’ – the number used to identify them in the ring. The handler will be wearing this on their sleeve, as an armband. Stand ringside, and mark down the numbers of the dogs that appeal to you. Look those numbers up in the catalog, and you’ll see who the owners and breeders of the dogs are. You can then contact the breeders, either through looking them up in the back of the catalog, or by googling their kennel name. A final tip – dog shows aren’t petting zoos. Please, be sure to ask permission before touching or petting anyone’s dogs. For coated breeds, this is doubly important, as nothing is more gauranteed to give a handler the vapors than someone mussing up the top knot they just two hours primping. If you bring young children, make sure that they’re not at a level to grab at dogs without your being aware. Not every show dog is even tempered, unfortunately, and little sticky fingers can easily get bitten (not to mention the stress of finding kid sized ketchup covered finger prints all over your white dog just as you’re walking into the ring). Spread Some Holiday Cheer – Bully Style! A quick correction – the design featuring the two adorable brindle mischief makers was actually donated by Carol Rowbo, and features her darling duo, Jacques and Jewels. In other news, look for our new calendar, available sometime over the weekend. It features 12 months of my favorite puppy photos, and 100% of all proceeds benefit the Karen Krings Memorial Fund and FBV Rescue. Happy Thanksgiving to my American friends and readers! Enjoy your turkey, and send well wishes to my two boys, Elliott and Dexter, as they hit the show ring this weekend. https://i0.wp.com/www.bullmarketfrogs.com/wp-content/uploads/2015/04/Brindle_pied_frenchbulldog.jpg?fit=662%2C662 662 662 frogdogz http://www.bullmarketfrogs.com/wp-content/uploads/2015/06/bullmarket-logo.png frogdogz2008-11-26 23:11:112008-11-26 23:11:11Spread Some Holiday Cheer - Bully Style! The fall out over the puppy mill bust in Quebec, Canada has led to a ton of hand wringing and hyperbole in media circles. CBC reports that Quebec is ‘the puppy mill capital of North America’, a fact that would come as welcome news to Pennsylvania and Kansas, two states that have been tied neck and neck for that title for the past decade. In the middle of the article comes a quote from the executive director of ANIMA-Québec, the government-funded group responsible for enforcing animal-rights laws, saying that the best way to avoid buying a puppy mill puppy is to “ask the owner of the pet shop where he is … [getting] his animals [from]”. That sound? That’s my head hitting my freakin’ desk. Where’s the insightful advice about how to choose an ethical breeder? Where’s the oft repeated, always on the mark advice about never buying a puppy from a pet store? Where’s the check list of things for the public to look for when purchasing a puppy from any source? Who pays your salary, ANIMA-QUEBEC? The best way to avoid buying a puppy mill bred puppy is to NOT BUY A PUPPY FROM A PET STORE. Any pet store. Yes – Even the pretty ones and the clean ones and the ones with cute names. Yes – Even the pricey ones in Manhattan or Beverly Hills. Yes – Even the ones who claim that they buy their puppies from ‘caring breeders’. Yes – Even the ones who say all their puppies are ‘registered’. Every pet store, everyplace, that sells live puppies gets their puppies from puppy mills. And pet stores? They lie. They’ll be HAPPY to tell you all about the caring, loving, clean breeders who they buy their puppies from. They’re lying. They’re liars. They LIE. Pound that fact into your heads. If you buy a puppy anyway, because you ‘really believe them’, then you’re either a sucker or a heartless jerk who really doesn’t care what happens to your puppy’s relatives. And no, I won’t sugar coat that for you so you can feel better about your over priced impulse buy. I won’t tell you that you’re still a good person who just didn’t know any better, because unless you live under a rock? No excuse. No excuse for saying “but I didn’t know”. Yeah, you did. You knew, but you wanted that puppy, right now, with no waiting, and billed to your credit card, and because of that, your puppy’s mommy just pumped out one more litter onto cold chicken wire with no vet care, substandard food, and a good chance that she’ll die during labour. Congratulations, your karma just tanked. Some people, of course, just refuse to accept that a clean, well lit pet store could possibly lie – after all, look how expensive their puppies are, and doesn’t expensive equal better? For ‘fun’, I just called Canada’s version of Petland, PJ’s Pets. Specifically, I called their most ‘upscale’ location, in Yorkdale Mall, and asked if they had French Bulldogs for sale. PJ’s “Puppy Sale” Department Rep: “We have three available right now – 3 black ones. They’re really adorable”. PJ’s: “They’re on sale right now – regular $3899, on sale for $3499”. PJ’s: “Oh, yeah, yes. They have papers for sure”. PJ’s: “Let me check. OK, these ones are from the US. They have US papers. Continental Kennel Association (sic). That means they can be registered here”. (I assume she meant Continental Kennel Club, and she’s completely wrong – American bred dogs can only be registered in Canada if they have AKC issued registration papers). 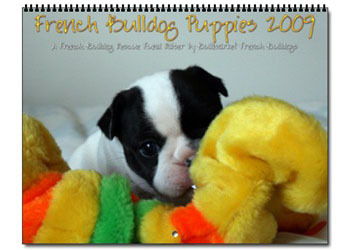 Obviously, this is a quality, reliable source of information about French Bulldogs. How could you not trust them with a $3500 purchase? But, just in case there is still anyone left who claims “But the pet store my puppy came from is different“, here’s the video story from the HSUS on their year long investigation into the link between Petland and Puppy Mills. Make sure to pay special attention to the parts where Petland employees claim that all their puppies come from great breeders. Oh, Mr. Obama. Has it really sunk to this – puppy pandering? This is gonna take a lot of puppies. Over on Medium Large, timely tips on how not to screw up Thanksgiving dinner. Again. 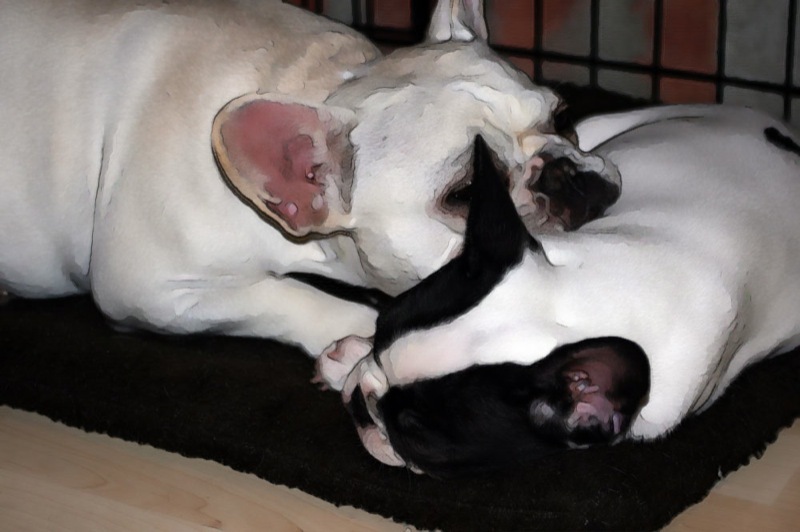 And, lest this post be not French Bulldog topical, here are a few manipulated sketches of Heart and Tula. Oh Photoshop, how do I love thee..